The Italian soccer club Bolgna FC was established in 1909 and was one of the founding members of Serie A. 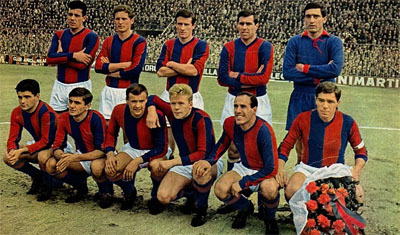 They have won Serie A seven times, the first time in the season 1924-1925. They have also won the Coppa Italia twice, the Mitropa Cup trice and the UEFA Intertoto Cup once. An important person in the foundation of the club was the Austrian Emilio Arnstein. Inspired by the Brittish football that dominated the game under this period, the club was used the letters FC (Football Club) in the name in addition to the name of the city. The club is also referred to as Bologna FC 1909 including the year of its inception.